We want to save the North Chapel and keep it open and used for 'the purpose for which it was conveyed, in perpetuity'. The people of San Diego and the United States as a whole deserve to keep this historic building a chapel open to the rental and usage of the people and not turned into anything else. 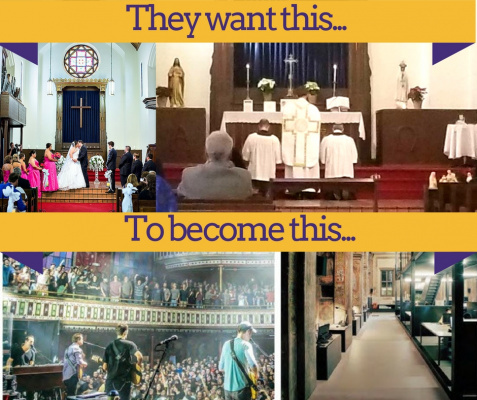 -Investigate the secret plan to allow 828 Venues (828venues.com) to gut the interior of the historic chapel after December 31, 2018; and reopening as “Chapel” in Spring 2019 – While to date, no permits have been submitted. -Ensure the North Chapel remains open and accessible to the public as it is today, beyond December 2018, without any closure while the investigation is being done. Right now, we are asking the City of San Diego, to order an investigation by the City Attorney into what is happening with the North Chapel so that all the legal facts that protect the exterior, as well as the interior of the chapel, are brought to light and it will be publicly restated and enforced that the chapel will remain chapel for the people, at little or no cost, as originally agreed upon and not turned into a 'retail restaurant' or anything other than what it has always been since the 1940's. They are still planning to close the chapel to public rental after December 31, 2018. We need to keep it open. History: San Diego citizens gave the federal government this land to have the US Naval Training Center. The federal government gave it to the San Diego City and the San Diego City gave it to McMillin who in turn SOLD IT to Pendulum and not the San Diego citizens and the US military across the world are losing their precious, historic chapel. The chapel needs to go back to the people. And legally, no one has a leg to stand on, to turn it into anything else. McMillin is closing the North Chapel to the local community on June 30, 2018 (as of 6/23/18 this date has been extended to December 30, 2018 - thanks in part to all of the petition signers) and they are looking for a leasee; they are advertising it as a 'retail/restaurant' space. This is WRONG. We don't want the North Chapel to be turned into anything else than a chapel. KEEP THE CHAPEL A CHAPEL. Please sign our petition to let the McMillin Company know that they need to preserve the historic North Chapel at Liberty Station NTC and allow it to remain the unique chapel that it always has been. They need to stick to their agreements. McMillin is going against all the agreements when given the North Chapel by the City for free. "The Federal Government gave (The North Chapel) to the City, the City gave it to McMillin. $0 was paid by McMillin. The quitclaim deed reads: "This property shall be used and maintained for the public purpose for which it was conveyed in perpetuity, as set forth in the Program of Utilization Plan" contained in the application submitted by the grantee (McMillin). The National Register of historic places: The Chapel is probably the least altered of the buildings altered in all of the Historic District (in Liberty Station), all wood furniture - including the pews, pulpit, choir loft, altar, organ an balcony railing- were designed for the church building and as were the stain glass windows, the brickentry and the decorative tile floors inside the entry. The building has provided a significant community function and is a notable visable landmark. Moreover, the style, craftmanship and details of the building are noteworthy and warrant architectural merit. This building is protected by the National Registry of historic places and Rehabilitation Standards by the US Secretary of the Interior's standards for treatment of historic property...The property shall be used as it was historically, or given a new use that requires minimal change to it's distinctive material; the historic character of a property (Chapel) will be retained and preserved. You get a piece of property for zero dollars, you got (a deed) that says you're not to change it...The Secretary of the Interior says the interior is not to be changed. What is so difficult about that? ...and (McMillin) states that (the North Chapel) is underutilized... meanwhile they are stopping all the people who are utilizing the property..."
Generations of of Navy Sailors used this chapel for worship, regardless of their denomination. Since then, memorable weddings, religious ceremonies and even funerals have been performed at the North Chapel. It is one of the last buildings still used for it's original purpose. To this day there are still two religious congregations that use the chapel for their weekly Sunday and other holy day services. This is a one-of-a-kind historic chapel and there isn't another one like it in all of San Diego. There is a magnificent pipe organ, baby grand piano and choir loft. It is an elegantly beautiful chapel with exposed wooden beams and stained glass windows . There are still buildings left to renovate and open spaces that can be built upon and the North Chapel doesn't have to be one of them. McMillin cited 'underuse' in an official statement to the press. This is the the same reason they used when they demolished the 'South Chapel' in 2010. McMillin wants to change the North Chapel into a retail restaurant, again citing the same reason, 'underuse'. Today couples are being charged $1,000 for 3 hours chapel use. Many couples are young and cannot afford that amount. That could contribute to underuse, but it is difficult to deny that the North Chapel is a popular location for people seeking a wedding venue. PEOPLE EFFECTED: Current parishioners of the two congregations that use the chapel, people who care about the historic nature of the building or the artistic value of the interior or people who attended while in the military at NTC, or peoplewere married there or have family whose funeral was there, or attended any other events there, and anyone who cares about and supports these people and more! Liberty Station has enough retail locations and restaurants, even still some empty buildings and plenty of land to create more restaurants on. The chapel doesn't have to be the place. Please join us! The local government is listening as more and more people's voices are added, and we hope McMilliin will too. We hope also that any potential future leasee will learn the value of this building and think twice before committing to a retail or restaurant deal. Every signature and comment counts! Heaven help us and God bless you.